Nvidia has released the GeForce Game Ready driver update necessary to unlock Microsoft DirectX Raytracing (DXR) on Pascal GTX 1060 6GB and better graphics cards. The surprising decision was announced last month with Nvidia touting the move as an opportunity to expand the install base for developers weighing up the “holy grail” rendering tech. Nvidia’s Turing architecture features dedicated silicon up to the task of real-time ray tracing called RT Cores. These cards also come with all new branding to reflect the change: RTX. Headlined by the RTX 2080 Ti, the signature feature of its RTX 20-series was the ability to render ray tracing in real-time, a task that its GTX cards were seemingly unable to compute and barred from trying. But that’s no longer the case, and Nvidia’s most recent driver package now unlocks DXR in-game to all users with compatible GTX cards. Any Pascal 10-series card more powerful than, and including, the GTX 1060 6GB is now DXR-compliant. This also includes the recently released GTX 16-series – the GTX 1660 Ti and GTX 1660. While these cards feature the Turing architecture, both are missing the dedicated RT Core silicon to augment the ray tracing experience. 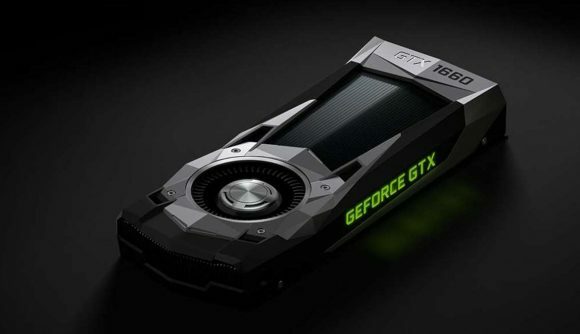 Nvidia claims in-game performance will vary drastically across ray tracing implementations, with highly-intensive reflections and global lighting – such as those found within Atomic Heart and Metro Exodus – performing the worst on Pascal graphics cards lacking dedicated silicon. Ray traced shadows and ambient occlusion, however, may be within Pascal’s grasp. These are far less computationally intensive and will not necessitate RT Cores depending on how game devs have implemented these effects. Nvidia’s own in-house benchmarks show the GTX 1080 Ti getting within playable framerates of 30+ in Battlefield V and Shadow of the Tomb Raider at 1440p. Although intensive ray tracing effects in games such as Atomic Heart, Metro Exodus, and 3DMark Port Royal require dedicated RT Cores. You can download the Nvidia 425.31 Game Ready driver here. Along with DXR support, it also offers optimisations for Anno 1800.